A couple weeks ago I was pleasantly surprised when “Clara: Angel of the Rockies” won the audience award for short films at the Women + Film festival in Denver! Oftentimes, the audience awards at festivals can be the result of the screening being filled with people who participated in or supported the film. Since most of my friends/supporters have seen the film at this point, I didn’t encourage them to come. But two very special people did come to this screening! Dr. George Junne, a professor of Africana studies at the University of Northern Colorado, and Roger Baker, a Clara Brown biographer, were both in attendance. They were two of my key interviews for the film and it was extremely special to have them at the Colorado premiere for this piece. As always, my partner, Jen Champagne, was there to support the film, even though she has seen it numerous times. I am extremely thankful for this award and hope it further validates a worthwhile story and project. This is a long overdue announcement about the national PBS award that “Clara: Angel of the Rockies” won from the show “To the Contrary.” As a result of the award, the documentary aired on 90 percent of the PBS stations around the United States. The show was directly responsible for sharing her story with thousands of people. Since then I have been in touch with all of the participants of the film who were equally thrilled to see the story reaching such a wide audience. Recently I had the opportunity to make a presentation about the Clara Brown documentary to the board of the Black American West Museum & Heritage Center here in Denver. This was an ideal chance to show the work in progress to a group of people whose opinion I truly value. In fact, it’s the first time any group of people has seen what I’m working on at all. The result was quite positive! I literally got a “thumbs up” and encouragement to move forward. As much as I love the story of Clara Brown, it’s important for me to realize that I am working outside of my own culture. It’s easy to step on toes, make blunders or make assumptions. I’m planning on adding some more discussion to the piece about the term “aunt” as a result of this meeting. 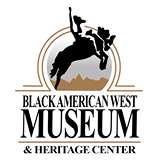 The consensus was that I can now say this documentary is “in cooperation with Black American West Museum & Heritage Center”. Once the work has screened at some film festivals, I will also be donating copies of the DVD for them to screen and sell. This was very exciting and validating! In asking for advice and insight from the board, one suggestion was that I look into the activities of the Black Genealogy Search Group in town. As a result I learned about an upcoming event called “Black Genealogy Search Group Heritage Festival 2015” which takes place in October. I plan to attend and look forward to learning more from here. “Story of Two Lives: Mother and Daughter United After a Separation of 30 Years” was a headline in the Denver Republican newspaper on February 18, 1882. Aunt Clara Brown and her daughter reunited after 30 years, an incredible miracle! After slavery, trying to find lost loved ones was a huge issue for many families in what was a chaotic and changing world. The chances of finding a loved one were made even slimmer due to limited resources, limited communication and name changes. Yet here they both are, together at last. There’s something very exciting about seeing their names in print. It’s some kind of verification of their existence. A more minor miracle than them being able to find each other is the miracle of any copy of this article being findable, or the fact that it was ever written at all. From what I’ve read, a similar article, which ran in the Council Bluffs, Iowa newspaper, was destroyed in a fire several years ago. That makes this newspaper article even more special. In order to see the Denver Republican article, it’s necessary to use microfiche at the main branch of the Denver Public Library. Yes. the old microfiche you are thinking of. Not everything is digitized. Somehow it’s fitting to use older methods to look at this information. It makes the experience seem more real, more tangible, partly because it’s harder to get to and access is more limited.